This is a little embarrassing, but I’ve been meaning to share this recipe for over three years now! Crazy, right?! Somehow every time I make it, I never manage to take pictures of it. That all changed the other night. I was finally able to dig out the old post and upload a few shots. Hooray, soup for everyone!!! I’ve probably mentioned this a million times, but my husband isn’t a big fan of soup. Looking at my recipe index you’d never be able to tell, because I LOVE soup. I kind of force it on him, but that’s ok, he usually ends up really liking it. 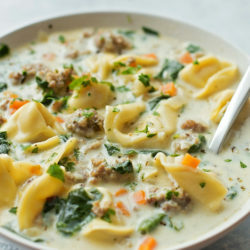 This soup though, it’s one of his favorites. 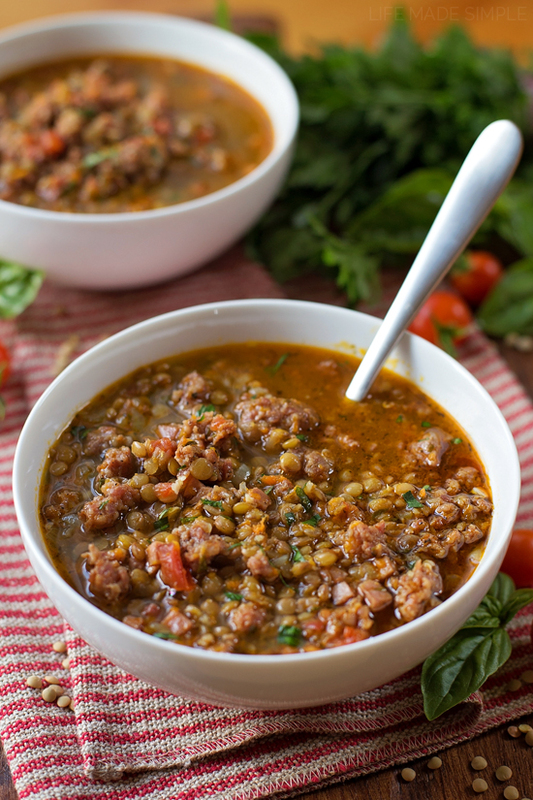 It’s a copycat version of the spicy sausage lentil soup that he gets when we go to Carrabba’s. 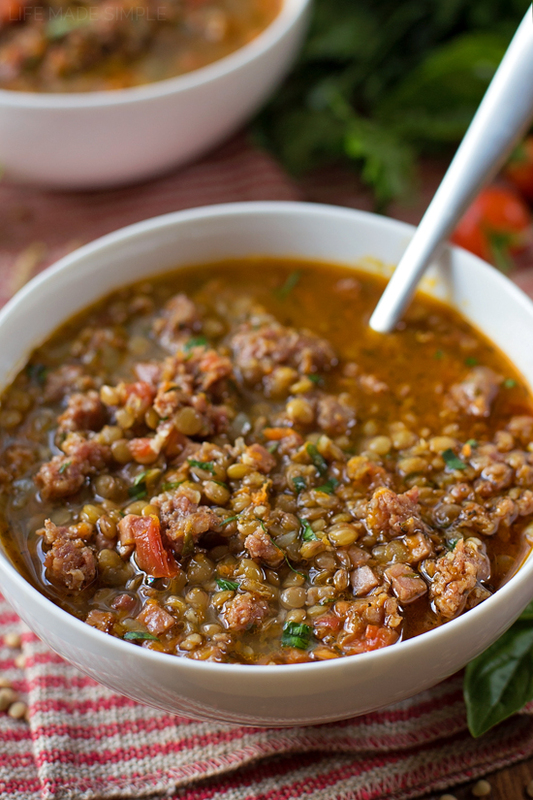 It’s loaded with hot Italian sausage, lentils, ham and veggies. I’ll be honest with you, the first time I made this for him I was pretty darn nervous. He had high expectations and I didn’t want to disappoint. Since then, I’ve changed a few things here and there and this is the “husband approved” version. He loves it, I love it and our 2 year old gobbles it up like there’s no tomorrow. It’s definitely a family favorite! The best thing about this soup is how easy it is to prep/make and how quickly it comes together. Sure you need a handful of ingredients, but they’re relatively inexpensive and easy to find. 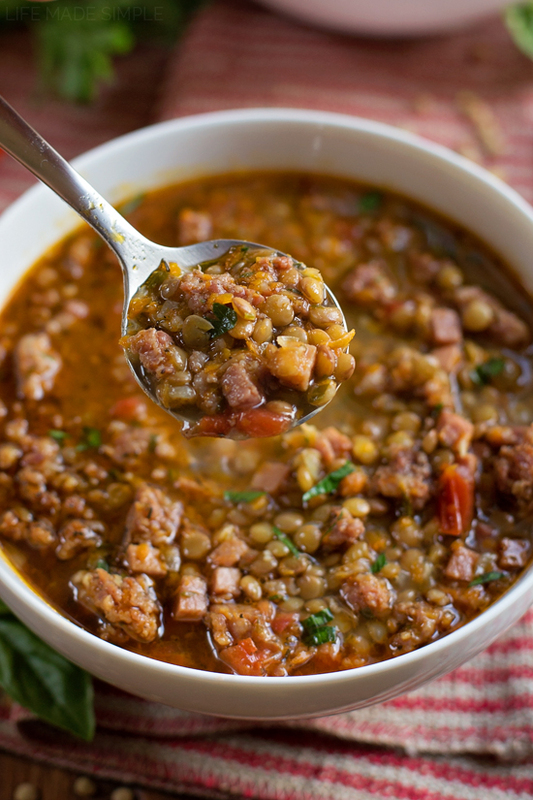 I like to pick up the lentils in the bulk section of our grocery store and I buy a thick slice of ham at the deli counter (that is if we don’t have leftover ham in the freezer from the holidays). The rest are items we have stocked in our pantry with the exception of the sausage. To make the soup you’ll need a large pot or Dutch oven. When you’ve got your ingredients prepped, add the olive oil and get it nice and hot. Saute the veggies until tender and then brown the sausage. Add the ham & tomato, then pour in the liquid ingredients. Bring to a boil, add the lentils & seasonings, simmer for 40-45 minutes. That’s it! If you’re ify on spicy, you can always use regular sausage and add a pinch of Italian seasoning or herbes de Provence to it. If you want to keep things extra lean add some turkey sausage instead of pork! 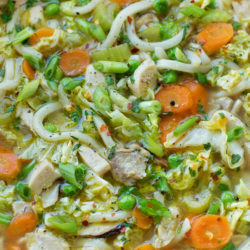 I guarantee everyone will love this soup! Serve it up with some crusty Italian bread and a side salad and dinner is served! In a large stockpot or Dutch oven set over medium-low heat, saute the onion in the olive oil until tender. Add the carrot, celery and garlic, cook for 1-2 more minutes. Add the sausage and brown, braking it into bits as it cooks. Add the chopped ham, tomatoes, water, chicken broth, vinegar and bring the soup to a boil. Pour in the lentils along woth the remaining seasonings/spices and reduce heat to a simmer. 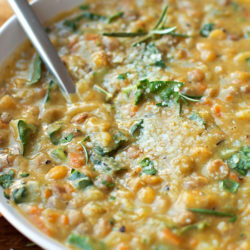 Cook until the lentils are tender and the liquid reduces, about 40-45 minutes. Remove the bay leaf and serve immediately. -You can use thick cut slices of ham and cube them in about ¼" cubes, I prefer getting one thick slice from the deli counter or using up leftover ham from holidays. This turned out amazing! Thanks for sharing. 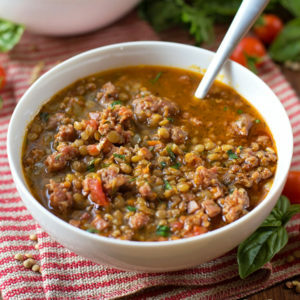 What lentils do you use red or other ? I prefer brown. Red gets too mushy (it’s better for curries) and green is a little too firm. Just made this and I thought it was fantastic, will definitely make again!! How many calories would you say is in a serving? Just finished making this and it’s amazing! I added 2 Jalapeños for that extra spice! Yumm! Love the added heat! I adde,d the jalapeño too — love this recipe! Yum! I’m always down for more heat! I usually buy freshly ground from our local grocery store, however Jimmy Dean works well too! That is an entirely different recipe. 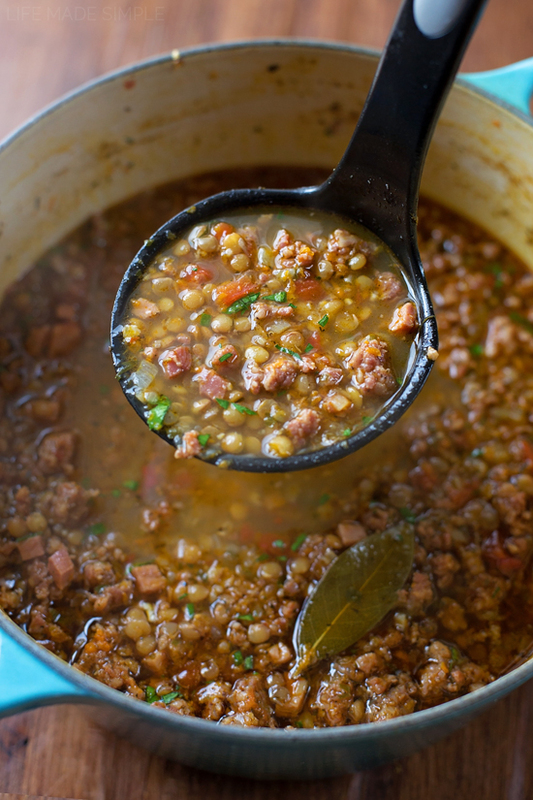 This is a recipe I developed years ago as a copycat to an Italian sausage and lentil soup. I just looked at those two recipes side by side… They are completely different flavor profiles. Why would you attempt to call her out on something without checking it out first? Geez. Just made this and it is excellent. So much flavor! I used Trader Joe’s Chicken Apple Sausage instead of the hot Italian sausage and used the Trader Joe ready to use french lentils. Cut the simmering time down to 20 minutes doing it this way. I also added 4 ounces of spaghetti broken up into little pieces. Made it even heartier. Thank you so much for this recipe. It was so good and so easy to make! Will definitely be making again and again! Fantastic and simple! I used pancetta instead of ham and homemade chicken stock. Added extra red pepper for some extra heat. I Used my Instant Pot and cooked sausage. Sautéed the onions/carrots etc in the rendered fat. Dumped everything else in and set at 25 min. Topped with some Parmesan. Tastes just like Carrabba’s. This is the second time making this and the entire family LOVES it!! SO good!! I left out the ham because I dont remember Carrabba’s having that? Maybe I’ll try it next time I make it. The flavor is really spot on when comparing it to Carrabbas. Thanks!! Thanks KC. I believe the ham is pretty small, but it’s definitely there. It’s probably been a good 5 years since I’ve had the real thing though, so maybe it changed? Made this for a Soup Night last night, and at over 100 different soups we have made, this one stands out as a real winner. Did 5X the recipe, and did 2/3 hot sausage and 1/3 sweet to tone down the hots. Managed to save a small container for leftovers. Do you mean 5. Times all? 5 cups of lentils? 5 times liquid? Very delicious soup Natalie!! Only problem I had was that the lentils cooked much, much more quickly than anticipated. So they ended up a bit mushy. The soup has great flavor and really packs a spicey punch. Hi Natalie: your recipe calls for only once cup of lentils. Is that correct or did you intend on it being 1 lb. 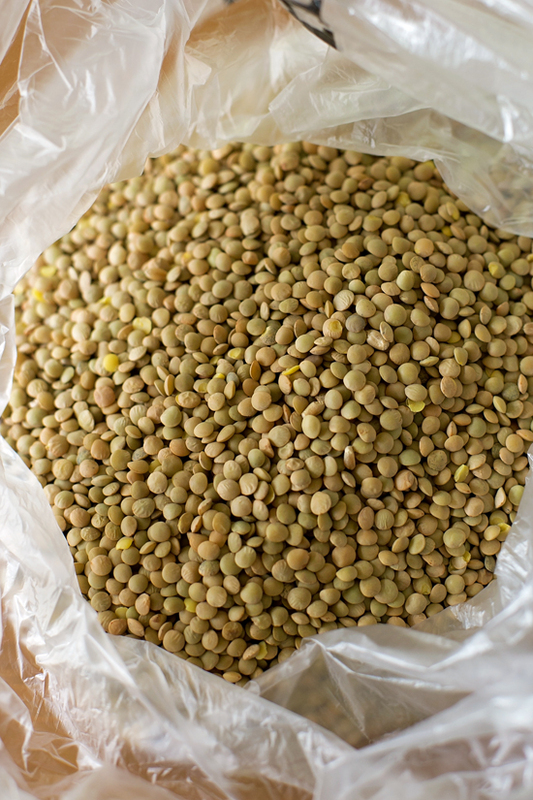 dry lentils? It’s really just one cup. You could probably get away with an additional quarter cup. Made this tonight for dinner. Left out the ham because I’m trying to eat less meat but followed the rest of the receipe. It was excellent! Definately keeping this receipe. This is a favorite! I like it with a little sour cream mixed in.